Now that we've had our first real look at the Ant-Man movie, it's time to start seeing the merchandise slowly roll in - and we're kicking off with the first Ant-Man action figure, complete with a teeny-tiny Ant-Man! As revealed on MTV, this plastic incarnation of Scott Lang is part of Diamond Select's long line of Marvel figures, rather than the Hasbro Marvel Legends Line (Ant-Man will definitely show up there too at some point. I mean it's a Marvel movie, there'll be merchandise out the wazoo!) - so it's scaled to fit in with their 7-inch tall figures rather than the slightly smaller Legends figures. But look! Itty bitty Ant-Man accessory! Not only does Scott come with a set of fist hands for business, he comes with a roughly 2-inch tall version of himself to emphasise Ant-Man's primary power, his shrinking serum. Of course, being a 7-inch figure anyway you could just pretend that's a shrunk-down Ant-Man, and this one is even smaller, but there you go. Alas, teeny Lang isn't an articulated figure but just a sculpted model - but still, it's a pretty cool way of acknowledging Ant-Man's shrinking nature. What else could they have done, dumped a packet of plastic ants in there too? Oh man, I hope at least one Ant-Man figure comes with an army of plastic ants. 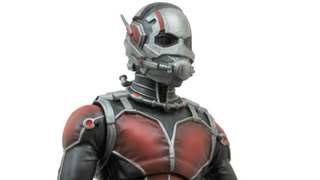 DST's Ant-Man figure will be out this Summer for $25. Now please join me in the queue of people snarkily asking how on earth does MCU!Ant-Man have an action figure already yet but there's not a single Agent Peggy Carter figure in sight!